Drano Max Gel is a top selling drain cleaning product in the drain cleaners category, which is now an everyday item just like every other common household item. Drano formula can be used in any drain in the home to get rid of clogs from drains from kitchen, shower and bathroom etc. Are you experiencing a clogged drain? Yes, it can be quite a nightmare especially if you are hosting one of those special dinners at home. You have guests at home and suddenly your kitchen sink starts regurgitating dark brown water along with potato peels and bits of all types of food. That’s when you will realise how embarrassing a clog can really be! Clogged drains are quite common place and can happen in any home. Depending on the type of drain clogged, the culprits can be fat, oil and grease also known as FOG, food particles, and hair. If you have already tried using salt and hot water to free up the drain but failed then don’t lose hope yet. There are plenty of solutions out there but one of the most remarkable tried and tested solution is the Drano Max Gel Clog Remover. What is Drano Max Gel? Wondering what is Drano Max Gel and how does it clean out clogged drains? Drano Max Gel is a highly efficient and powerful clog remover. Drano is a brand of drain cleaning products that is being manufactured by S. C. Johnson & Son. S. C. Johnson & Son is an American multinational with presence in over 72 countries across the world and their estimates sales is in excess of $7.5 billion. 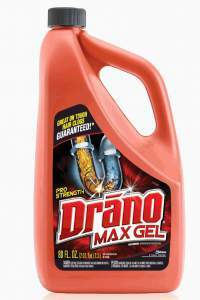 Drano invented by Harry Drackett, was incepted in 1923. There are several other Drano products including Drano Aerosol Plunger, Liquid Drano, the Drano snake plus drain cleaning kit, professional strength crystal clog remover, and advanced septic treatment among others. Drano max gel was created using a combination of several ingredients. The idea behind creating this powerful clog cleaner was to ensure you can get rid of the toughest clogs especially those that have been created by oil, fat, and hair. There are several natural solutions being promoted over the internet but there are many people out there who have tried it all and failed. We are talking solutions like baking soda and vinegar mix, plungers, and even boiling hot water but they all failed to clear the clogged drains. So, how does Drano max gel fare in such a scenario? It does just great! Pour in about half a bottle and let it sit in there for around 20-30 minutes and then just pour some hot water. It takes about 5-7 minutes and you will find the standing water gone. Yes, you heard it right, gone! These ingredients are:You are probably wondering at this point in time, how is it better than any other clog removal product. Simple, the Drano max gel contains 5 different ingredients and they work together to make it a potent clog remover. Sodium hypochlorite: This is used in laundry bleach to remove mold and mildew. A Proprietary Surfactant Blend: As the name suggests, it is proprietary and hence a list of ingredients in this blend is not available but here is the good news: the blend consists of several cleaning agents that work towards removing dirt as well as any deposits that have build up around the dirt. Sodium silicate: This is a corrosion inhibitor and provides a protective coating for metallic surfaces especially the ones in your sink. The true effectiveness of Drano max gel clog remover has been proven time and again through review videos. It is a proven fact that it can actually dissolve hair and transform into slime in almost 14 minutes and 45 seconds. The only way you can actually see that happen is when you grab a bottle for your kitchen sink! Here’s a quick fact: Drano max gel clog remover contains chemicals that not only help dissolve soap scum, hair, and gunk but if used over longer periods, they can prevent any buildup in your kitchen or bathroom drains. How does it dissolve hair or dunk? This potent clog remover contains microorganisms that release enzymes, which in-turn break down residue. Here’s a really good news: Drano clog remover can be used in both plastic and metal pipes and it will not cause any harm to the pipes or plumbing system unlike what most products do. Where to Buy Drano Max Gel? The Drano max gel Clog Remover is available in a 80-Ounce handy jar that will last you for the entire month. You can buy your bottle from Amazon . There are some really good deals available especially if you are planning to stock up. Check the discounts available for 8 jars pack. Drano Max Gel is definitely one of the best drain clog removers you can actually lay your hands on but don’t take our word for it, just use it! It’s not expensive, can provide higher degree of clog prevention, and ensures you never have to feel the embarrassment of a flooded bathroom sink.